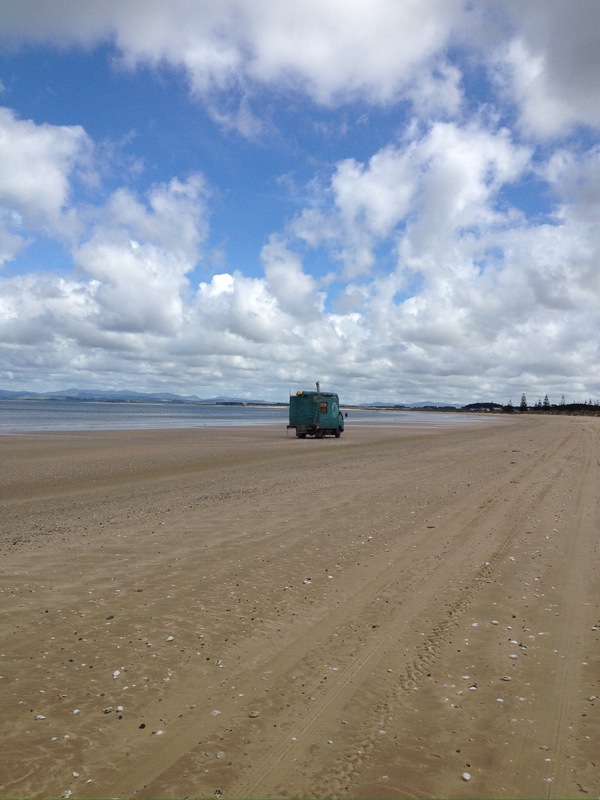 We were quietly minding our own business and had just put out the fishing line on Tokerau Beach. 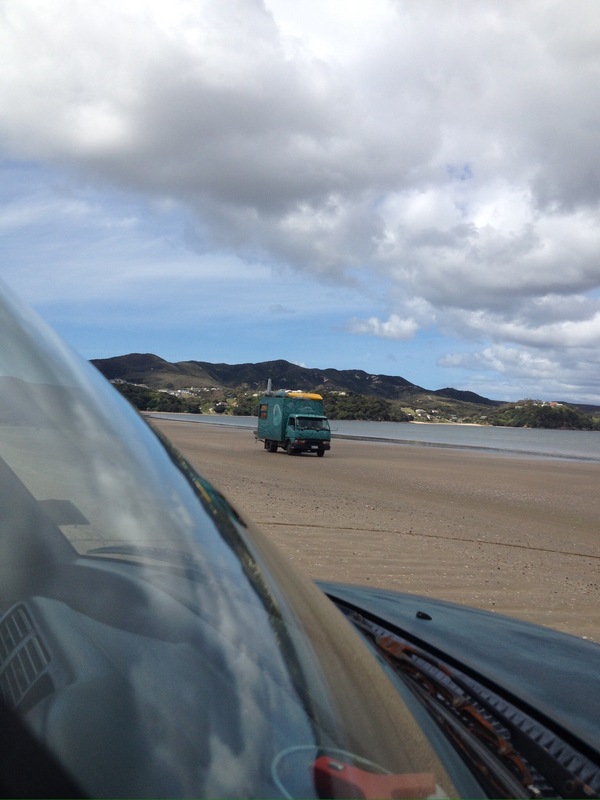 I had just moved the car back up the beach away from the incoming tide when I spied a vehicle coming along the beach toward us. What is it, I wondered ? I wonder if Roy has seen it? Yep, he sure has seen it and probably is wondering, just as I was, where they are off to along the beach. There they go, I didn’t see where they went or where they got off to beach but I presume they were not going to be camping on the beach otherwise they may well have been getting a close encounter with the tide around their wheels. 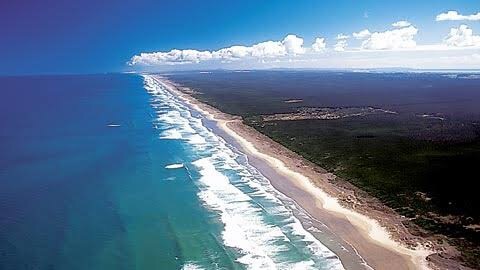 Ninety Mile beach is in fact 55 miles (88km) but it sure does seems like it’s a 90 mile stretch of beach when you get onto it. 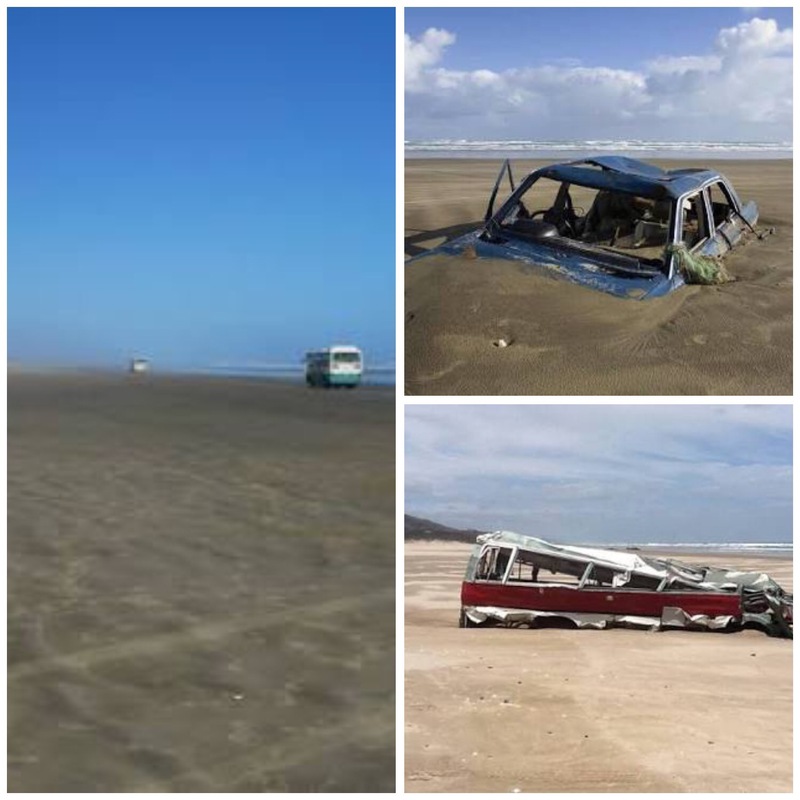 From Houhora, the beach is only 10km away on the west coast and as we have not yet kite fished off a west coast beach we thought this was an opportune time especially as the wind was in the right direction. The beach becomes somewhat of a race track at weekends and holidays, and with yesterday being Labour Day and the first long weekend for some months, it seems as though quite a few other people had decided that they would race up and down the beach in their cars. 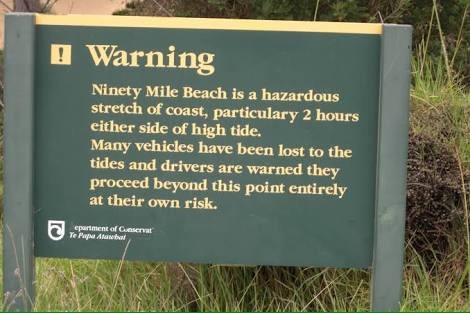 The beach is an official part of the highway network therefore the usual road rules apply, however, sometimes common sense does not! 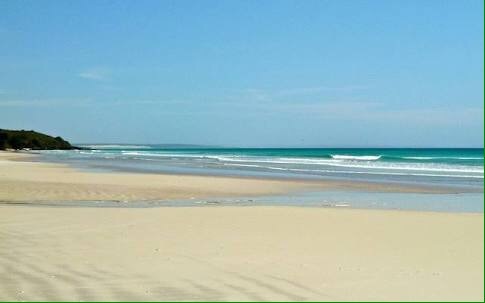 In 1932 the beach was used as the runway for some of the earliest airmail services between Australia and New Zealand. 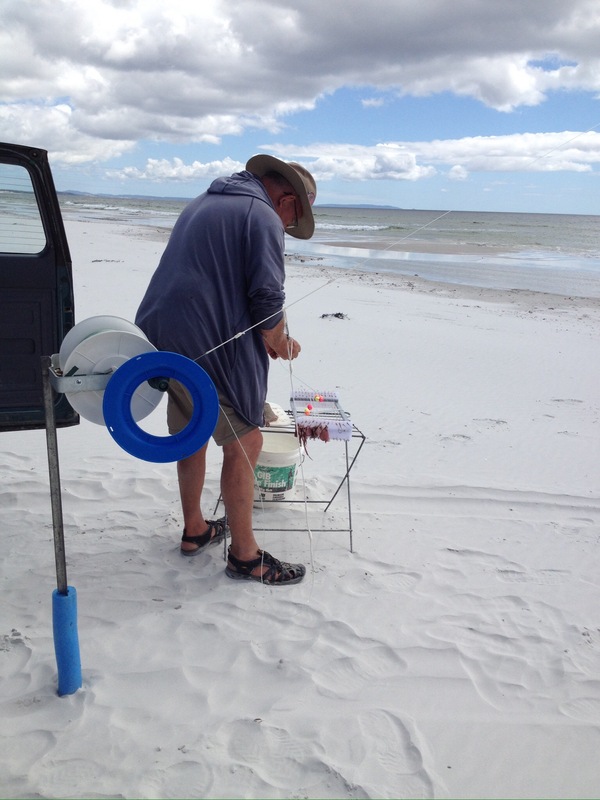 Time for us to put out the kite to see what we can catch and in particular, the difference between fishing the east coast versus the west coast. 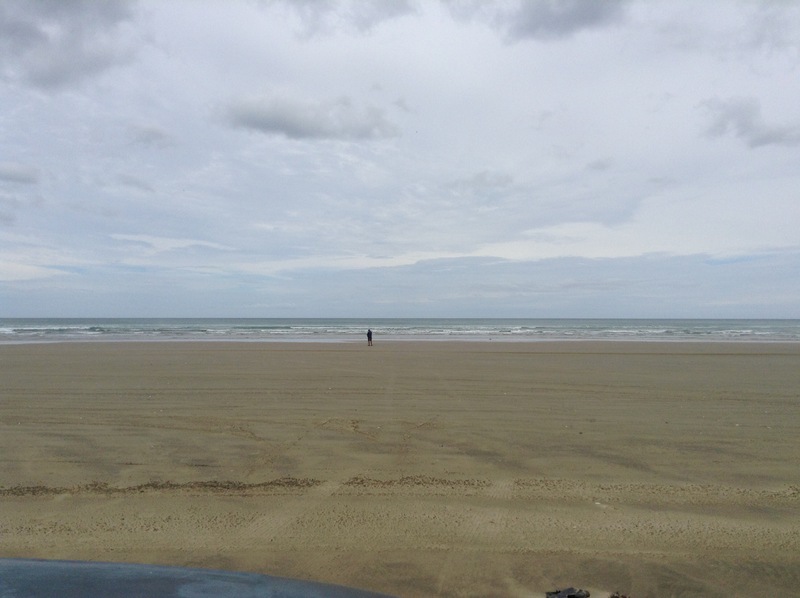 That’s Roy in the distance, keeping an eye on the reel whilst I moved the car back up the beach, well away from one of those rogue waves that take many people by surprise. The surf and wash on this beach is vigorous which means we have to try and get our line out as quickly as possible through the surf so as not to tangle up the line. That done, we settled in to wait, not too long though as we have been told not to leave the line out for too long as sharks are known to chew through lines. After 30 minutes we pulled the line in to find two good sized snapper and a trevally. 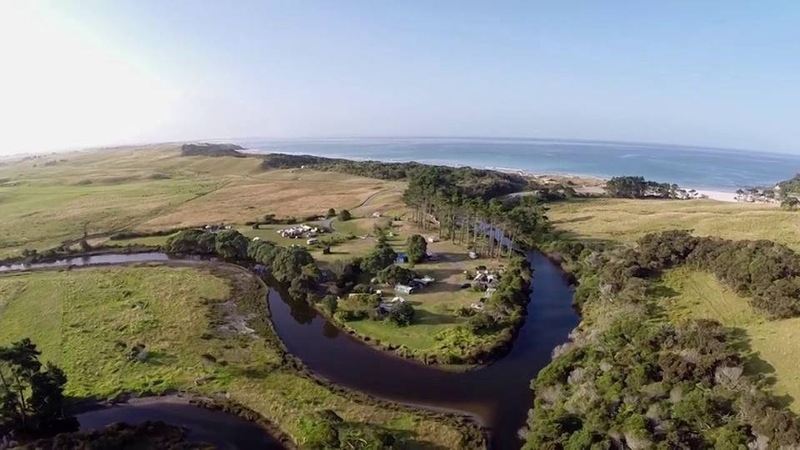 An overview of the camp area wedged between the curves of the river. Last Friday Roy and I decided that we would go down to the beach and have another fish, the weather was overcast with the odd shower coming through but we thought it was worth going to the beach and having a try, besides, it’s better being on the beach than finding jobs to do in the van. So off we went and we soon had our kite out flying, not too far out though as we know that there is a reef about 900m off shore and we don’t want to get our lines caught on the reef. We text Pat & Sue to let them know that the wind was going in the right direction for kite fishing so they came down as well and set their kite out further along the beach. Once the kite is safely locked off its just a waiting game, when we play the guessing game of trying to determine how long we should keep the line in the water – usually we figure about an hour is good.But what do we do for an hour? sometimes one of us will wander off for a walk along the beach and a beachcomb, other times is just a matter of sitting and waiting. This time however, we came prepared. 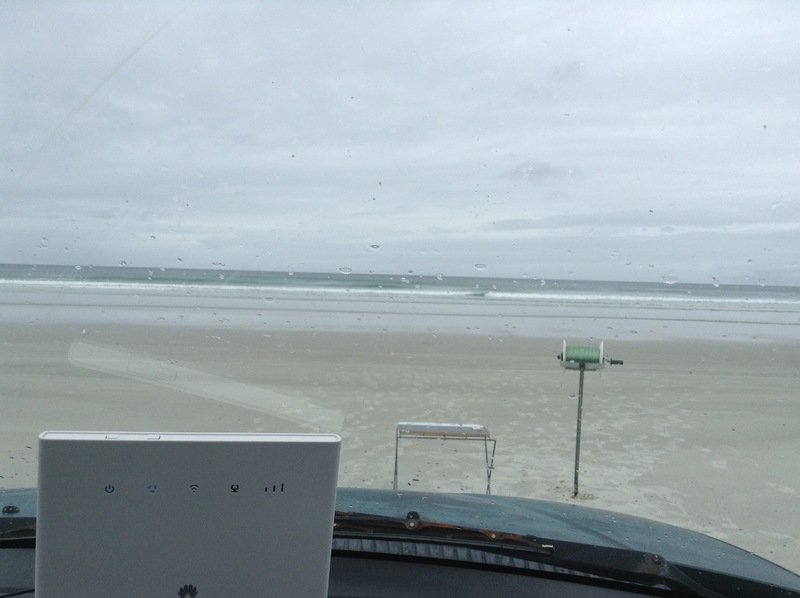 As we can drive the car onto the beach and sit in the car to wait we had brought with us with our wifi router and iPads with headphones so we could both watch/listen to our individual choices of programmes and dodge the showers. 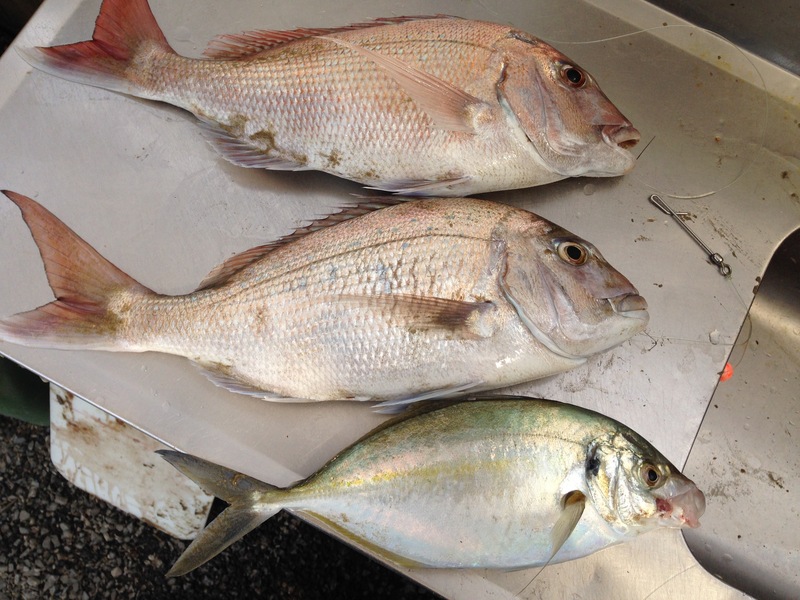 Not to be outdone, Pat & Sue caught 3 snapper and a small trevally. With all this fish to deal with We thought that it would be a shame to waste the fish frames and heads as there is plenty of edible fish left behind. We sometimes smoke the heads and wings and have lots of smoked fish but this time we thought we could give them away. I had read about a web site that puts you in contact with people who are happy to pick up heads and frames for their use so we decided to give it a go. I rang a lady on the list and yes she would love to come and pick up the heads and frames. Within an hour she was at the camp delightedly taking away all the heads and frames. 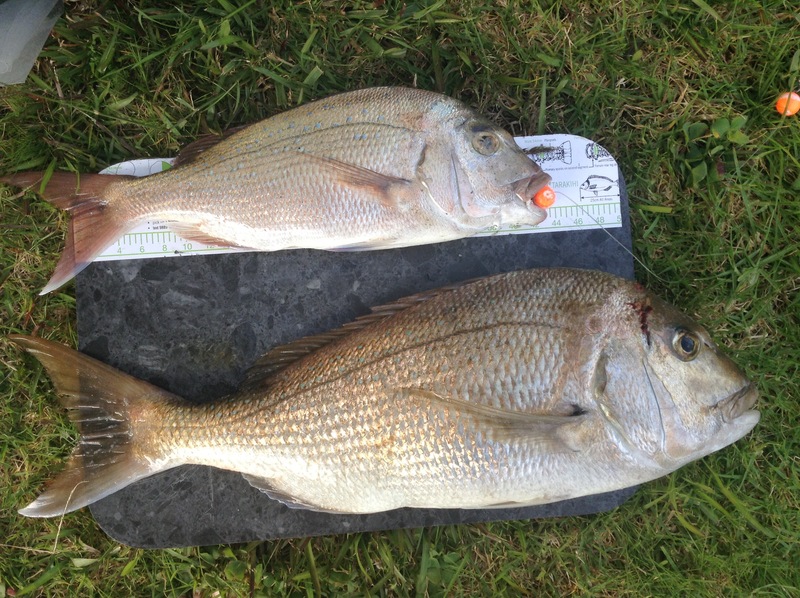 The website is Free Fish Heads a fantastic initiative as it means there is no waste. The lady rang me later that evening to say thank you, that she really appreciated having such lovely fresh fish heads and her family really enjoyed them. It’s not all fishing and relaxing when we are on the beach though, one day Roy and I were just settling down to wait patiently for the line to do it’s thing when we see a young lady come walking toward us with purpose in her stride. When she finallygot to us, she was so out of breath and in between sobs, she struggled to talk. We sat her down and tried to calm her somewhat before she could tell us of her tale of woe. It seemed that her car had skidded off the road back at the entrance to the camp. She had already walked into the camp area to try and find help but as there was no one around she had then trekked down to the beach to find us. Poor thing was beside herself. I took her back to her car to see if we could tow it out, but it was too difficult and I did not want to create even more damage to her car by attempting to move it so after much discussion we called a local towing company. They were with us pretty quickly after only waiting 20minutes, in that time I discovered she was visiting from Argentina and was hoping the car was not too badly damaged as she only had a week left in New Zealand. Once she was sorted I left her in the capable hands of the tow truck driver and returned to the beach to help Roy pull in our line. 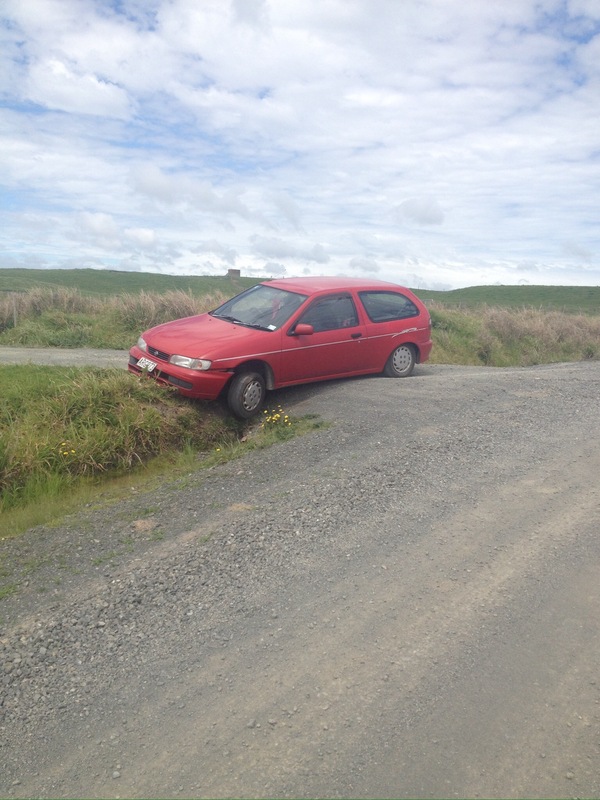 This is not the first accident we have seen on this particular corner, as on previous visits to Rarawa we have seen a couple of vehicles on their side either in this ditch or the one on the opposite side of the road. 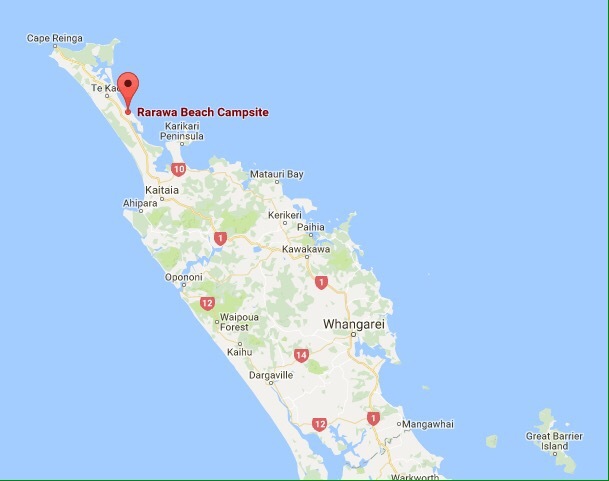 We picked up the van on Tuesday afternoon, initially we had hoped to return to Rarawa but the camp had been closed that day for the next 3 weeks as DoC are treating the campsite for Argentinian Ants. So plan B was instigated. 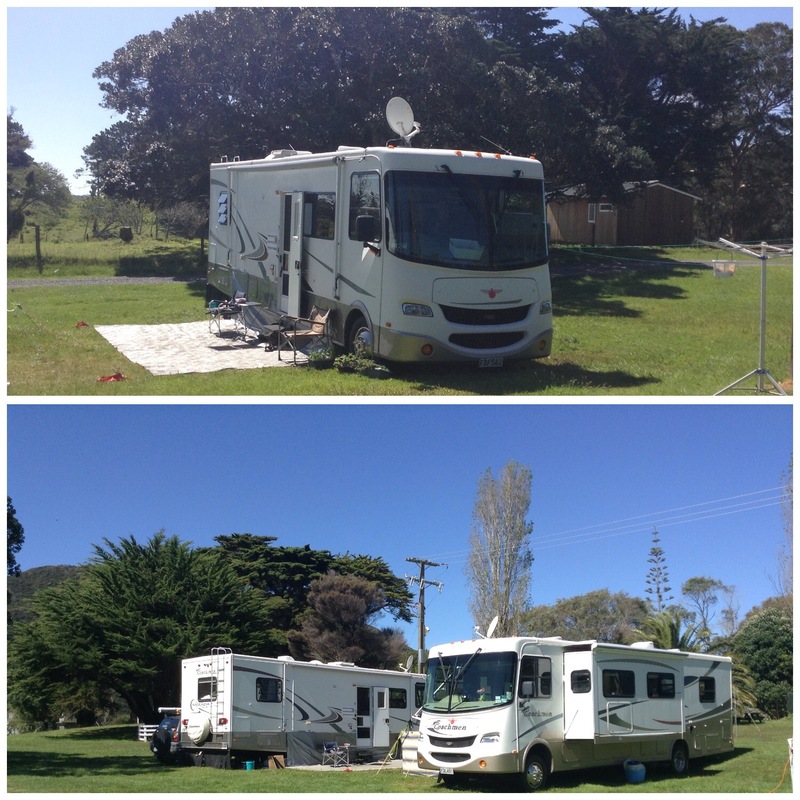 Instead we headed back up to Houhora where Pat & Sue were already parked and here we will stay for a week. 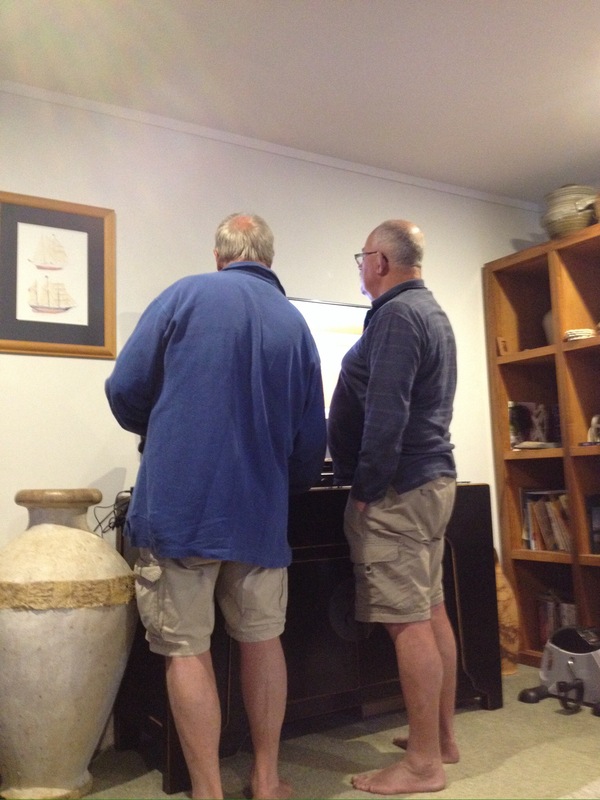 Pat & Sue wanted to go and do some fishing in their wee boat, and with Houhora having a safe harbour they can easily launch it and go off fishing in and around the harbour. 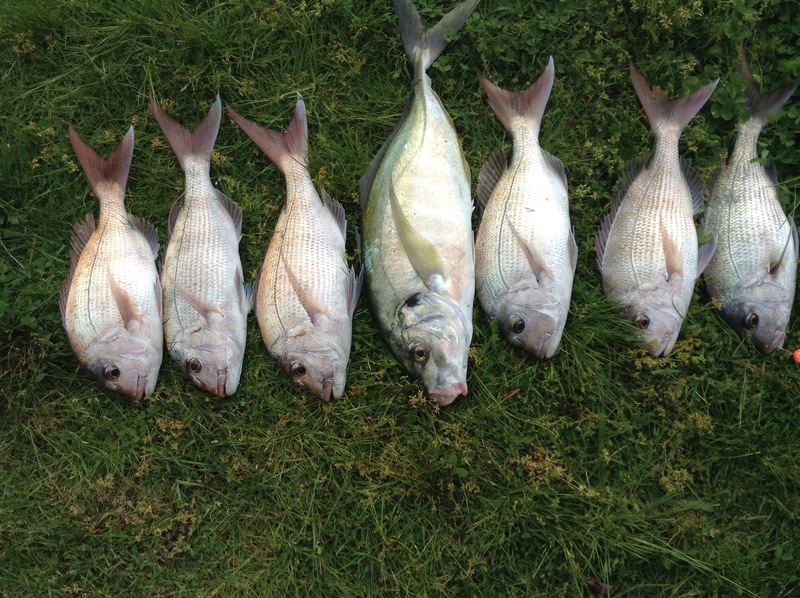 But it’s only 15 minutes from here to Rarawa so yesterday Roy & I went up to have another fish off the beach. We sent the kite up, attached the long line and proceeded to wait. Roy baiting up the hooks. On hauling the line back in we only had one fish on the line, a reasonable sized Kahawai which we decided to use as bait and immediately sent the line straight back out again. The next retrieve was much more successful with these two beauties landed to take home. Needless to say we have had fish on the menu most days and as well, the freezer is full of vacuum sealed packs of fish fillets, enough to keep us going for sometime. 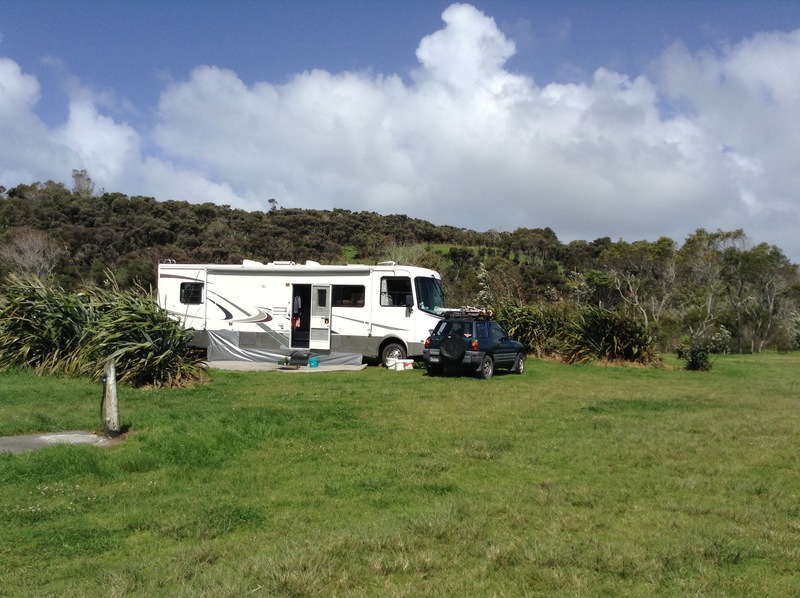 It had been fine for a few days, the ground had dried out nicely but with some heavy rain forecast for the weekend, we decided it was time to make a run for it and leave Matai Bay whilst the going was good. 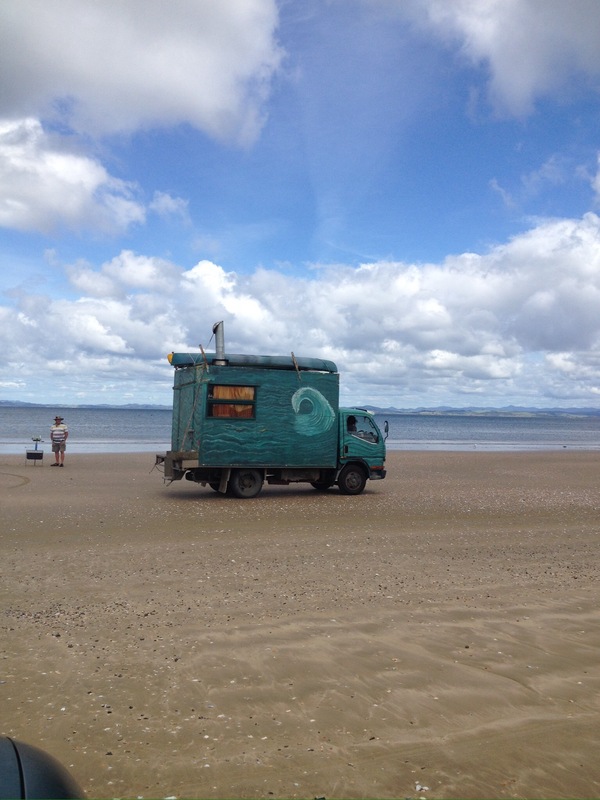 Roy & I packed up the van and he and headed out of the camp to return to the PoP at Tokerau Beach for a few days. I stayed on at the campsite to wait for Pat & Sue to return from their fruitful fishing trip over the hill so I could help them pack up and head on out before the rains came. We stayed at the PoP over the weekend and sure enough we did get plenty of rain which would have made it almost impossible for us to be able to get out for bother week or so. 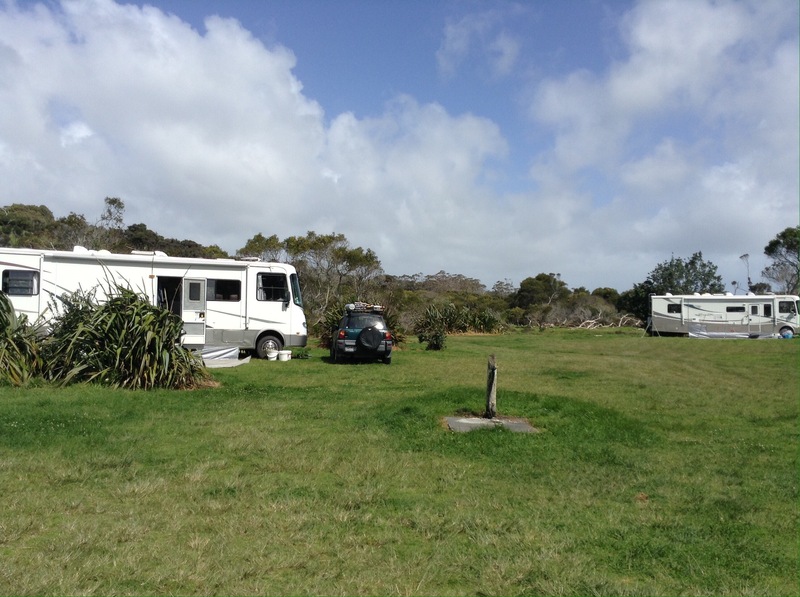 We headed off into Kaitaia early on Monday morning as the van was booked in for a service and wi lots of little jobs and shopping to get done we managed to wile away the day nicely before spending the night at the Kaitaia RSA. With everything done by lunch time on Tuesday we were all soon on the road heading to Rarawa, a DoC camp north of Houhora. The ground at Rarawa was also very muddy and soft in places but after a good walk around, we settled into our chosen spot. here we are parked, with some shelter on three sides from the wind. With Pat & Sue parked at the far end. We’ve had some good amounts of rain and some very strong winds since we arrived here, we are hoping that the winds will die down enough to enable us to get the kite out for some fishing to be done over the next week or so. Meanwhile, with all this inclement weather, we are making full use of our upgraded Internet, all of which will be the subject of a later blog post. Watch this space.